So I have the following 5V 30amp led strip psu which I am currently using to power several other brand microcontrollers, however these boards use a simply dc Jack for power, I'm wondering if I cut the USB end off a regular USB wire, can I simply hook power and ground up to the psu in other to supply power to my Rpi via the micro USB end? Meaning I would be leaving the 2 data lines of the USB dangling and only running power and ground to the Rpi. Or would this not work? Looking at the Pi3 and Pi3+ schematics, the specified input voltage upper limit for the regulator is about 5.5 V, so putting 12 V in would almost certainly fry the board. You can get efficient 12 to 5 volt regulators from a number of sources. e.g. https://www.pololu.com/product/2850. Last edited by MarkTF on Wed Jul 18, 2018 5:44 pm, edited 1 time in total. That should work fine as long as you use a large gauge power wire and/or keep it very short. That appears to be a Mean Well power supply, one of my favorites, which will only put out 5.0V. With the large current draw and voltage level sensitivity of a RasPi 3B+ having a 5.2V output power supply is better for longer, or thinner gauge, wires. 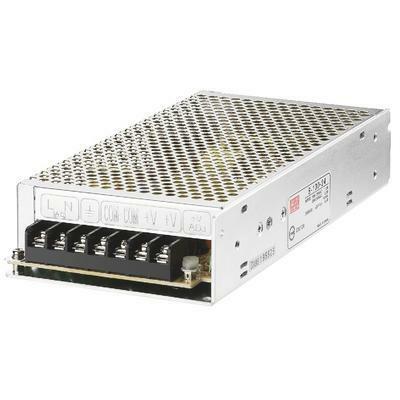 The PSU pictured has adjustable voltage output. The small pot at the right hand end of the terminal block is so labelled. Excellent, I didn't spot the adjustment pot in the picture and the last 5V Mean Well I bought was not adjustable. Thanks for th guidance guys, will post my results here once I get my hands on some decent micro USB wires!